Snacks Items: Chips, namkeen , farsan, frymes, Popcorn etc. Snacks Items: Chips, namkeen , farsan, frymes,Popcorn etc. Dimension (W x H xD) in ft. 7 x 11 x 6 (without Conveyor). *NOTE: THE SPEED OF MACHINE MAY VARY ACCORDING TO PRODUCT AND GRAMMAGE. 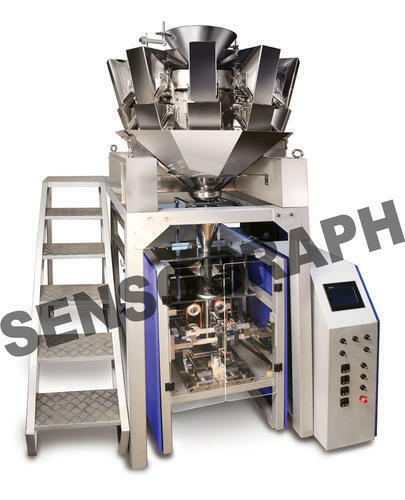 “Made In India” Multi head weigher, it incorporates the entire electrical, electronic , micro controller based system conceived designed, developed & manufactured in our state of art manufacturing facility. The software developed by our R & D team is incorporated in this machine. Strip or individual count cutting provided. Machine works on single phase. In house manufacturing of all electronic control instruments. We are the Manufacturer, Exporter, Trader of Weigh Filler Machine, Powder Packing Machine, Packing Machine, Flour Packing Machine and more. Sensograph Packaging Technology Private Limited was set up in the year 2007. By using advanced tools, our engineers and technicians manufacture these weighing and auger machines in compliance with the set industry norms and regulations. Known for their high performance, energy efficient design, user-friendly operation and longer functional life, these weighing and auger machines are demanded in food processing industries. Being a quality conscious organization, we assure that the premium quality is maintained at all time. For this, we have set up a huge in-house quality testing unit and a team of skilled quality inspectors.